Food for the skin is important as food that you eat. Skin Food relaxes and soothes your skin and keeps it hydrated all day long. A High quality body lotion that feeds the skin with cold pressed natural oils and premium herbal extracts.. Drinking water, eating greens, and breathing deep calms your system and maintains the health of your skin cells. SKIN FOOD makes your body glow. SKIN FOOD is highly effective at the skin due to it’s active ingredients reflecting land and sea. The ideal balance of minerals and nutrients for complete nourishment inside and out. – Radiantly healthy smooth as silk skin. – All Natural and Organic Composition. – Free of BHA and other Chemicals. – Skin Safe. Free of Synthetic Parfume and Parabenes. 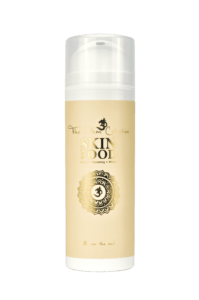 Skin Food Body Lotion is light and fast absorbing, with a fine texture so it does not leave oily traces on clothes. Olive oil is rich in vitamins, minerals and essential fatty acids and in combination with herbal extracts nourishes and protects the skin at the same time. Aqua,Olea Europea Fruit Oil*, Maranta Arundinacea Root Extract*, Gelidium Amansii Extract, Theobroma Cacao Seed Butter*, Lanolin Cetearyl Alcohol, Cera Flava* Angelica Archangelica Root Extract, Thymus Serpillum Extract, Leuconostoc/Radish Root Ferment Filtrate, Sambucus Nigra Fruit Extract, Usnea Barbata Extract, Zeolite, Tocopherol, Rosmarinus Officinalis Leaf Extract*, Xanthan Gum, Dehydroacetic Acid and Benzyl Alcohol*, Citric Acid and Silver Citrate, Cocos Nucifera Oil*.